* ATLAS BREW WORKS: Ivy City's brewery/tap room Atlas Brew Works announced last week that it is coming to JBG's West Half building next year, where it will occupy 4,500 square feet mere steps away from the Nats Park Center Field Gate. The new space, double the size of the Ivy City location, will also have a kitchen and a "limited food program" along side its brewery and 12-draft-line tap room. Atlas is the second announced retail offering at the non-box-like West Half building, along with the previously announced Commons Restaurant and its bakery/breakfast operation Mah-Ze-Dahr. * DISTRICT DOGS: The neighborhood's second-largest population gets a new retail offering in the coming days, as District Dogs has announced it will officially open its second full-service pet care facility in the ground floor of 1221 Van on Saturday, March 9. In a custom-built space that faces South Capitol Street just north of N, DD will offer daycare (with four separate playrooms), boarding, grooming, walking, sitting, and a "boutique retail shop." There will be an open house on Friday, March 8 from 5 to 9 pm, and services can be booked starting on the 9th. * EL BEBE: A reminder that Circa's tequila-and-taco sibling El Bebe is opening this Tuesday, Feb. 26, on the southwest corner of 1st and M in the ground floor of the 99 M office building. Here's the menu, should you wish to peruse in advance. * SHILLING PROGRESS: A reader passed along on Twitter photographic evidence that the Shilling Canning Company seems to at last be inching closer to opening in the ground floor of Arris, on Water Street across from District Winery. The placeholder web site says "Opening Spring 2019," and the restaurant is now hiring. * WELLS FARGO COMING DOWN THE STREET: If your heart was broken last summer when Wells Fargo closed its branch in the ground floor of 20 M, you can now perk back up, because it was announced last week that a Wells Fargo "Express Center" will be coming to the ground floor of the aforementioned 99 M office building. With this, 99 M's retail space is fully leased. * CIRCA OPEN, EL BEBE SOON: The neighborhood's newest restaurant opened on Monday, with Circa finally arriving on the southwest corner of 1st and M Streets, SE, not quite 3 1/2 years after it was first announced. As for now, it's open daily at 4 pm. And its sibling El Bebe is coming Any Minute Now. * MEYER TO THOMPSON: The Thompson Hotel at 3rd and Tingey is still under construction, but the Post's Tom Sietsema reported in his chat last week that uber restaurateur Danny Meyer (he of Shake Shack, Gramercy Tavern, and more) will be opening a "full-service restaurant and rooftop bar" in the hotel sometime in 2020. There aren't many details (not even a chef), but this will be a project that will garner a lot of interest. * ALBI POPUP: If you are looking forward to Albi, which is bringing a "contemporary vision of Middle Eastern cooking as soon through the lens of Modern American techniques and Mid-Atlantic ingredients" to the Bower at 4th and Tingey in "early summer" 2019, there is a two-day "pop up" of "preview dinners" on March 3 and 4. Reservations now available, with prices set at $85 per person, plus optional wine pairings for $35. * CAPPER SENIORS GONE: The first building I watched be built is now the first building I've watched be both built and demolished, though the concrete stairwells and elevator shafts remain and await the building that will replace the structure destroyed by fire last year. This makes for a sad entry #182 in my Demolished Buildings gallery. * VOTE FOR MOVIES: Time once again to make your preferences known in the Capitol Riverfront BID's 2019 Outdoor Movie Series poll. Voting ends March 4. * LOWER 8TH STREET STUFF: ANC 6B commission Kirsten Oldenburg reported in her latest newsletter about some changes to traffic flow near 8th and Virginia, now that the tunnel is completed: "The 800 block of Virginia Avenue and the 900 block of 9th Street SE are now two-way streets and the 1000 block of 9th Street SE between L and M Streets will join them as a two-way street but awaits adjustments to the traffic signal at 9th and M SE. The 800 block of L Street is to become two-way (instead of one way westbound). Pedestrian crossings markings will be added to the 9th & Potomac Avenue SE and 10th & Potomac Avenue SE intersections. " She also says she is in the process of asking DDOT for a traffic calming study of the 8th and L intersection (i.e., where the Brig is). * SHOTS FIRED: Apparently gunshots were heard on Half Street SE near the Big Stick on Sunday night, and MPD reports that a suspect was arrested for the unlawful discharge of a firearm. * SOUTH CAP OVAL DETAILS: If you really want to go into the weeds (or grass, or trees, or paving stones, or pedestrian flow) of the two traffic ovals coming to either side of the new Douglass Bridge, these two documents supporting final approval for the designs from the National Capital Planning Commission are for you. Also, WashCycle has a detailed look at the final proposed designs, from a bicycling point of view. * CIRCA COMING SOON: Signage is up, training has begun, and Circa says on its Facebook page that its opening date announcement is "coming soon." * CAPPER SENIORS COMING DOWN: Demolition began last week on the remnants of the Capper Seniors building at 5th and Virginia, SE. DCist has a summary of a report on the fire and its aftermath by the federal Bureau of Alcohol, Tobacco, Firearms, and Explosives. The official cause remains classified as undetermined, but there are theories--and ATF also faulted DC Fire officials for being too cautious about letting search crews and "other agents" into the building after the blaze. UPDATE: Here is the report itself. 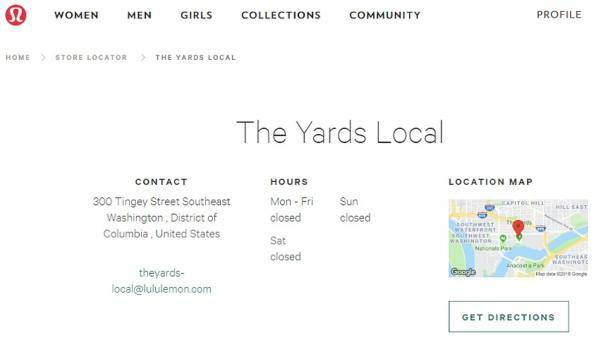 * LULULEMON COMING: Yoga pants and other accoutrements will be coming to the Boilermaker Shops on Tingey Street in the Yards, according to the company's web site. It will move into the space vacated by Steadfast Supply's move to Water Street. * SOMEWHERE COMING: "Somewhere", an "intergrated retail and cafe concept" from folks on the team that created Maketto on H Street will be coming to F1rst in 2019. The press release says it will combine "a highly curated retail mix of high end clothing, sneakers and other footwear, unique brand products, as well as planning and orchestrating community events. The team will also develop programming for the residents of F1RST, including interactive social media opportunities, style consultations and more." * RETAIL INDUSTRY COMING, SORT OF: WBJ reports that the Retail Industry Leaders Association has agreed to lease nearly 13,000 square feet at 99 M.
* HALF STREET WAREHOUSE HALF GOING: Partial demolition is underway on the red brick former GSA warehouse on the southeast corner of Half and L, which was purchased by the Lerner Companies last year. According to the permit, they are taking off the roof and the top part of the walls, down to a height of about four feet. What's the plan? An "open uncovered parking lot," according to the permit. Enjoy your fresh thread, commenters! * PEET'S COMING VERY SOON: I took this photo yesterday evening, intending to post it today and say "it looks like Peet's Coffee is getting close," but a Twitter follower has now scooped that with a picture of this sign on the door today, which announces the grand opening as Monday, Aug. 13, at 5 am, with a "family and friends" event on Saturday, Aug. 11 from 11 am to 2 pm. For those who haven't been waiting for the opening of the neighborhood's 250th coffee shop, Peet's is located just north of the New Jersey and M entrance to the Navy Yard-Ballpark subway station, in the ground floor of Insignia on M.
* BIKE PATH COMING SORT OF SOON: Work continues to bring Virginia Avenue back to life as the Virginia Avenue Tunnel project wraps up, and the photo at right shows the progress of the new bike path that will run *alongside the pedestrian path. * I would assume that the deep crushed gravel is not the final surface, but it's going to be a very nice alternative to getting between 2nd Street SE and Virginia Avenue Park/points east. I don't have a date for when the paths will be completed, but the entire project is supposed to be finishing in October. * ALSO COMING SORT OF SOON: Also of note is the arrival of the signage for Barre 3 on 1st Street, though the interior does not look like we have reached Any Minute Now territory. And a peek behind the Bluestone Lane window coverings at 99 M would seem to indicate that the arrival of the neighborhood's 251st coffee shop is not imminent. * CAPITAL ONE CLOSING SOON: Was mentioned by a commenter recently, but here's official notification that the Capital One branch in the ground floor of 1111 New Jersey is closing in September. * Truckeroo returns on Friday, Aug. 10. * Nationals Park is having its first-ever Farmers Market on Sunday, Aug. 12, from 10 am to 2 pm. Other than that, it's August. It's hot. I took a positively epic number of photos on Saturday, and one of spots I captured was the southwest corner of 1st and M, where Skanska's 99 M office building now appears in more or less its final form (except for the retail spaces). Of course it made me think of that spot's "before photo," which is one of my absolute favorites, because it shows the old Normandie Liquors building, all alone, in May 2006. Just one block to the south, demolitions were underway to clear the site that would become Nats Park, but this photo gives no hint of the radical changes about to come. And then I thought about how I have taken so many photos of this corner since 2006, because the actual corner lot took so long to be developed, and because so much happened right around it. And I realized that it is probably one of the best spots to illustrate what has happened in the Near Capitol Ballpark River Yards neighborhood over the past 15 years. By June 2007, cranes are visible to the south, as work on the ballpark is well underway. Later that year the distinctive steel work of 55 M appears next door, and the new building rises up above the Normandie--until February 2008, when the little yellow brick building meets its demise. The ballpark is now clearly visible from 1st and M, just in time for its debut in late March, 2008, and by the end of that year, 55 M's exterior is finished. And then the view freezes. It's the same for all of 2009, and 2010, and 2011, and 2012, and 2013, until at last a crane appears at the south end of the 1st Street block in spring 2014. Up goes the Hampton Inn, and it is followed in 2015 and 2016 by F1rst and the Residence Inn. Finally, in May 2017, 11 years after the Normandie stood alone, the southwest corner of 1st and M finally has a skeleton of its own, as 99 M at last makes it above ground. And now, one year after that, the sidewalks are open, and the garage-like doors where Circa will host hordes of stadium-goers are visible. I'm guessing the beverages at Circa will cost a little more than they did at Normandie. This is of course just one of a whole lot of corners that have radically changed in the past 15 years, and some of them even had a similar start-stop-start timeline, but I do think if one corner has to be picked to tell the story, it's this one. * MORE COFFEE! : Because you addicted folks can't get enough of that witches' brew you all pretend to like, I'll mention that Eater has reported that Australian chain Bluestone Lane has signed a lease to open a coffee shop a 1,014-square-foot space in the ground floor of the 99 M office building that will also be home to Circa and Open Road. Here's the deets on the existing location in Georgetown. Both the building and Bluestone are expected to be finished later this year. * OATH OPEN: They kind of snuck in without a lot of fanfare, but Oath Pizza is now open next to Bethesda Bagels on M Street between 1st and New Jersey, joining All-Purpose and Declaration, which both opened last week. Now we await Wise Guy Pizza at Canal Park. * CHLOE REVIEW: The Post's Tom Sietsema gives Chloe his "good/excellent" rating. * YARDS PHASE 2: I was kind of surprised at the volume of coverage earlier this week about the second-phase plans at the Yards, which mainly shows the power of sending a press release to every development reporter in town (though not me). If you've been following my posts about "Yards West" since, oh, early 2014, the plans for well over 1 million square feet of office space on the footprint of Spooky Park at 1st and M and two residential buildings on the current parking lots on the south side of N Street is not really anything new. But the press release attached a 2019 start date attached to this next phase, and it also passed along two renderings, including one showing what the release describes as a "six-block spine" beginning at a new plaza at New Jersey and M, extending all the way to the Anacostia River at Diamond Teague Park, described as "a vibrant pedestrian-friendly street, featuring ground-level retail and dining, extended green spaces and a variety of public gathering areas." In all, "Yards West" will have about 3 million square feet of mixed-use space across 18 acres. Here are the renderings, showing the planned office building for "Parcel F," on the northeast corner of 1st and N, and the aforementioned "spine," looking south toward the river. But what if Amazon picks the Capitol Riverfront/Poplar Point HQ2 proposal, which includes these lots (seen on this map as locations 9 and 10)? Or is this a hint that it's not expected to be chosen? We Shall See! * PARADIGM PART 2: WBJ reports late this afternoon that Paradigm has now purchased the rest of the block bounded by New Jersey, 1st, K, and L. This includes the Eagle Academy building and the taxi garage next door, on New Jersey. The company is just getting started with its 275-unit residential building at 1000 1st Street, on the west side of this block (known as Square 740), and apparently is planning a twin for the other part of the block. Other holes in the ground I won't highlight this time around include the Bower's sibling rental project at 4th and Water, Toll Brother's Parc Riverside Phase II at Half and L, the Jair Lynch residential project at the Half Street Hole, and the combo project at South Capitol and M for the new National Association of Broadcasters headquarters and its next-door residential project labeled 10 Van. Finally, I'll close with a shot of a tearing down rather than a building up, and that's the pile of debris formerly known as 37 L Street SE--just in time to mark the 40th anniversary of the Cinema Follies fire, on Oct. 24, 1977.